In this series on mastering your attention, we have emphasized the fact that attention is not just the ability to focus on a single task without being distracted, but in fact is comprised of several different elements that must be effectively managed. But this doesn’t mean that single-minded focus is not of paramount importance. Yesterday we compared managing your different kinds of attention to being the supreme commander of your mind – you must be able to deftly maneuver and deploy your units to various battles. But good management can only get you so far; to win the war on distraction, the absolute strength of your voluntary attention — your focus foot soldiers – greatly matters. Research has shown that individuals who can sustain their attention for long periods of time perform better on all sorts of cognitive challenges than those who cannot. A man with a scatter-shot attention span will only be able to experience one plane of existence; he can skim across the surface of the world’s vast knowledge and wisdom, but is unable to dive deeper and discover the treasures below. The man with an iron-clad focus can do both; he is the boat captain and the pearl diver and the world is truly his oyster. If you have a goal to learn and understand as much about the world as you possibly can before you die, strengthening your power of concentration is not an option, it’s a necessity. 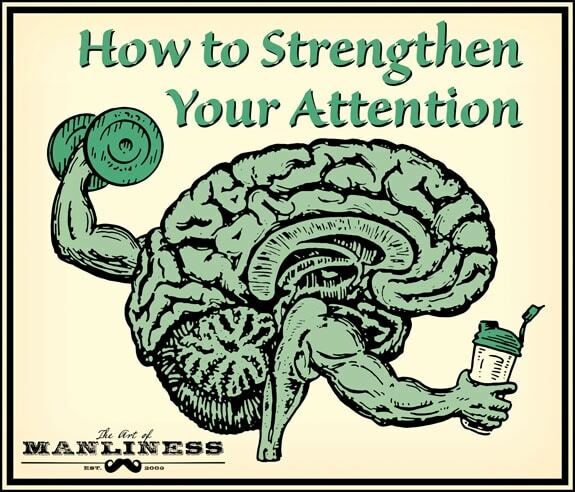 Last time we used the analogy of being supreme commander of your mind to explain attention management; when it comes to attention strengthening, we’d encourage you to think of your mind as a muscle. The parallels between strengthening your body and strengthening your mind are in fact so close that it’s really not so much an analogy as a description of reality. Your physical muscles and your attention “muscles” both have a limited amount of strength at any given time, their stamina and power can either atrophy from inactivity or strengthen from vigorous, purposeful exercise, and they require rest and recovery after they’ve been intensely exerted. You get the same feeling of internal dread/doubt right before you begin an intense workout – the one that says “I’m not sure I want to do this” – as you do right before you decide whether or not you’re going to read a long article, and in both cases you have to set your mind, bite down, and get going with it. Just as you can hit a wall in a tough workout where you think you can’t do one more rep, in the middle of reading a long article your mind will want to quit and surf to another tab. In both cases, if you tell yourself to dig deeper, you’ll be surprised how much more strength and focus you actually have left in the tank. And while everyone’s looking for cool new “secrets” for how to build both their body and mind – shortcuts and hacks heretofore undiscovered – the truth is that strengthening our physical and mental muscles comes down to plain, good old fashioned, highly unsexy work. Gaining strength in either area is ultimately about eating right, getting ample sleep, and engaging in challenging daily exercise. So put on your lifting belt and chalk up your cranium. We’re going to hit the mental gym and turn your focus into a beast. Below, you’ll find your brain’s workout plan. 1. Increase the strength of your focus gradually. If you decide you want to physically get in shape, but are starting at ground zero, the worst thing you can do is to throw yourself into an extreme training program – you’ll end up injured, discouraged, or both, and you’ll quit before you even really get started. 2. Create a distraction to-do list. Because the internet has made any bit of information instantly accessible, we tend to want to look something up the moment it crosses our mind. “I wonder what the weather will be like tomorrow?” “What year did that movie come out?” “I wonder what’s new in my Facebook feed?” Consequently, we’ll toggle away from what we’re working on the instant these questions or thoughts pop into our minds. Problem is, once we get distracted, it takes on average 25(!) minutes to return to our original task. Plus, shifting our attention back and forth drains its strength. 3. Build your willpower. Voluntary attention and willpower are intimately entwined. Our willpower allows us to deliberately ignore distractions while staying focused on the task at hand. It would serve your attention span well to review our in-depth article on strengthening your willpower. 4. Meditate. Not only does meditation help keep you cool, calm, and collected, research has also shown again and again that mindfulness meditation can boost your attention span significantly. 5. Practice mindfulness throughout the day. In addition to dedicating 10 to 20 minutes a day to mindfulness meditation, attention experts recommend finding opportunities to practice mindfulness throughout your day. Mindfulness is simply focusing completely on what you’re doing, slowing down, and observing all of the physical and emotional sensations you are experiencing in that moment. 6. Exercise (your body). Not only can you compare exercising your mind to exercising your body, doing the latter actually directly benefits the former. Researchers have found that students who engaged in moderate physical exercise before taking a test that measured attention spans performed better than students who didn’t exercise. The researchers found that exercise primarily helps our brain’s ability to ignore distractions, although they aren’t exactly sure why. I would venture to say that the discipline it takes to push through the pain of a workout strengthens the same supply of willpower that we use to ignore the itch of distractions in order to keep working/focusing. 7. Memorize stuff. We’ve talked about memorization on the site before. Besides being a cool bar trick and providing you a fount of poems to recite at the drop of a hat, memorizing stuff is an excellent way to exercise your mind muscles. Make it a goal to memorize a poem or a verse of scripture each week. What About Attention Training Games? Brain training games have received a lot of press in recent years. You’ve probably seen commercials for Lumosity or Brain Age on Nintendo DS. The games’ creators claim that spending just a few minutes a day playing can improve your attention, memory, and mental agility. However, the research on the veracity of these claims is divided. Some studies indicate that brain training games can help improve attention in children with ADHD or in the elderly, but that they don’t benefit young, healthy adults. Other studies show that while certain brain training games can boost attention levels, those gains don’t crossover to other areas of life. In other words, brain training games can help people pay better attention and do better at brain training games, but they won’t help people pay better attention in class or while studying. A recent study showed a certain type of brain training game called n-back can improve working memory (an important aspect of attention) and that improvement can crossover to other cognitive challenges. So what does this all mean? The verdict is still out on whether these brain games will definitively increase attention spans and further research needs to be done. It won’t hurt to try them out as part of your attention training program, but include the other suggestions outlined here as well. 8. Read long stuff slowly. Fight the TL;DR culture. With the rise of tablets, e-readers, and smartphones, some studies indicate that reading of e-content in general has gone up nearly 40%. This is a good thing, right? You’d think so, except that Slate recently did some research with the help of website analytics company Chartbeart that determined that only a paltry 5% of readers who start an article online will actually finish it. What’s more, 38% of readers never scroll beyond the first few paragraphs. So to say that reading in general has gone up would be misleading. What we’re actually doing is more scrolling, and less engaging. 10. Practice attentive listening. Focus isn’t just useful for intellectual endeavors. It’s also an essential interpersonal skill. The ability to be fully present with a loved one or friend builds your rapport, intimacy, and trust and with them. At the same time, making an effort to focus all your energy on someone else strengthens your concentration muscles overall. It’s win-win. So next time you’re talking with your main squeeze, put away your phone and listen as attentively as possible. 11. Perform concentration exercises. The above exercises not only boost your focus, but offer other benefits as well. Every once in a while, however, it’s good to do some exercises that are aimed purely at boosting your concentration. Here are twelve to try. Modernity has given us a lot of comforts and conveniences, but it has also unleashed a torrent of stimuli competing for our attention. To live a truly flourishing life amidst this cacophony of distractions, mastering your attention is key. At the end of your life, who you’ve become, what you’ve learned and accomplished, and who’s there at the end with you will be the sum total of what you chose to pay attention to each year, day, and hour of your life. Will a series of cat videos flash before your eyes? Or will you look back on the deep conversations you had with your family and friends, the books that changed your life, and the little details you discovered in all the places you visited? We hope our series on attention has gotten you to think about this increasingly precious commodity in a new light, as well as inspired you to take steps to improve it. You’ll be amazed how much your life can improve just by paying attention to your attention.